Dalmally Parish Church, interior. View of roof beams. Dalmally Parish Church. General view from South-East. OS 6" map, Argyll, 2nd ed., (1900). See also NN02SE 2 and NN12SW 8. The church of Dysart (Glenorchy) at Dalmally, is mentioned from 1390. In 1586 it stood on an island. The present church was built in 1811 on the same island. Orig Paroch Scot 1854; W J Watson 1926. There is no trace of an earlier church. There are several late medieval grave slabs in the burial ground. The church is still in use. Visited by OS (D W R) 19 March 1973. RCAHMS 1975, visited July 1971. 4/5/15-33 John Campbell, Inveraray, to Lord Breadalbane, with enclosures June-November 1806 - need to build new church in Glenorchy and plans to be submitted for it by Mr Stevenson of Oban. Payments made to Mason, Wright and Slater. The work included making 3 new windows. Book of Accounts kept by Archibald Campbell, Chamberlain. Building of the new Church. Letter to Lord Breadalbane from James Elliot, Architect. The contract is to be completed with (Allan) John Stone, (Mason Contractor), but as the season is well advanced the work is unlikely to be completed before January 1810. Note of estimate made under other matters concerning Johnstone and Millar, (Wrights). It amounts to #1526:2.3 1/2. Memorandum states that it was built according to the plans of James Elliot, Architect, but he was not responsible for the supervision of the work but only for its final inspection. Proposed Church to be built at Glenorchy. Letters, specifications, estimates and contract. The estimate accepted from Allan Johnstone, mason-contractor amounts to #1552.3.7. Memo for the Earl of Breadalbane. Allan Johnstone's drafts to be honoured and the balance of #252 paid. The unusual octagonal church at Dalmally, serving the parish of Glenorchy and Inishail, was designed for the 4th Earl of Bread alba ne in 1808 by an Edinburgh architect, James Elliot, who was at that time working on the Earl's castle at Taymouth, in Perthshire. The church, probably the third to occupy the island site since the medieval period, was opened for worship in 1811. The interior, which was re-arranged in 1898, has two side banks and one central bank of pews facing the pulpit at the west end; additional seating being provided in a horse-shoe shaped gallery. 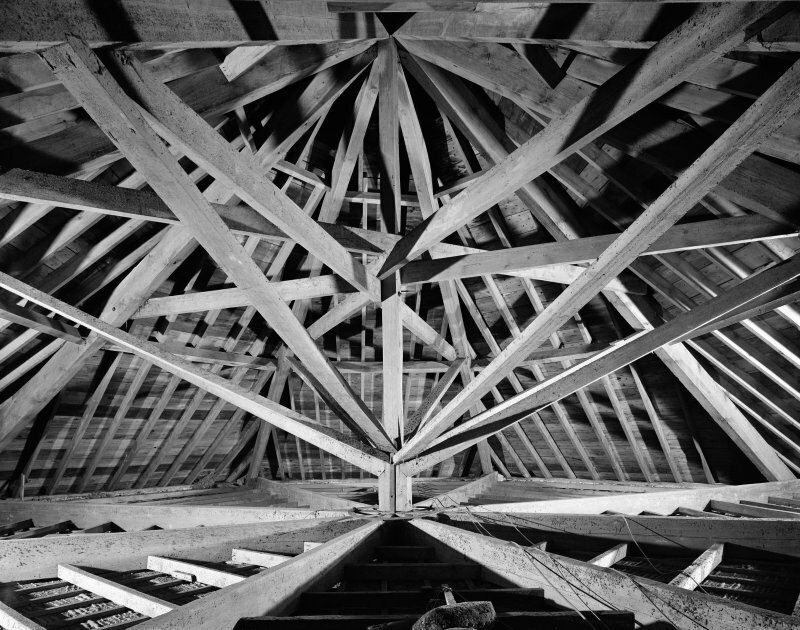 The roof is flat, but the illustration shows the complex system of internal timbers that holds this unsupported span in position. The churchyard contains a range of late-medieval stones of some importance, including an example of the Loch Awe School of carving with border, plant scroll with animals and figure of the warrior at the top typical of that school. The second stone, much smaller than is usual and presumably the graveslab of a child, is also of the Loch Awe School. The third stone, later perhaps in the West Highland sequence of carving, is also of interest because it has been appropriated at a later date as the inscription shows, '1819 James McNicoll, Achallader'. NN 16764 27516 and NN 1537 2785 A geophysical survey was carried out 23–24 July 2012 on two sites with a close archaeological and historical association with Clan Gregor, as part of the Clan Gregor Glen Orchy survey project. At site one, Dalmally Parish Church, a GPR survey was carried out to look for evidence of previously disturbed burials and/or earlier churches. At site two, Bothan na Dige, a combination of GPR and resistivity survey was carried out to look for traces of an alleged medieval moated enclosure, associated with Clan Gregor. A topographic survey undertaken at site two was used to place the results of the geophysical survey into its wider context. 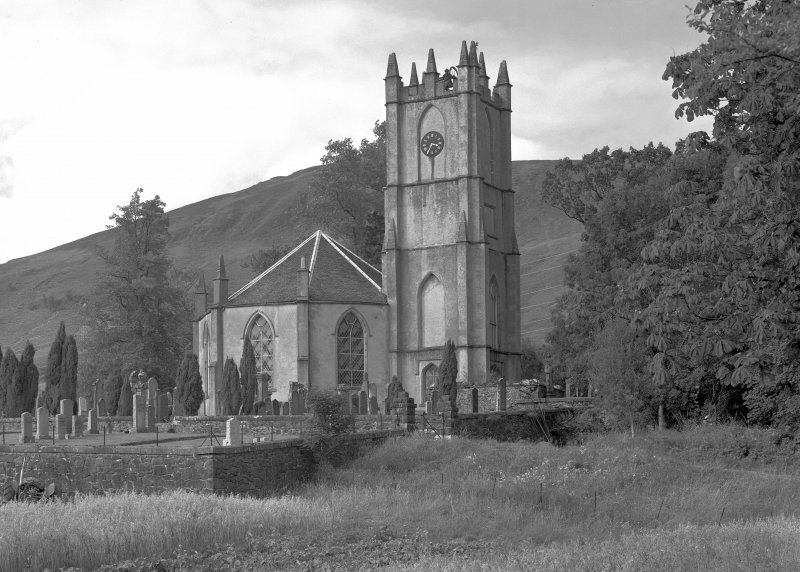 The results at Dalmally Parish Church suggest that there may be traces of an earlier church preserved within the footprint of the current church and that anomalies recorded at the E end may relate to earlier burials. The results at Bothan na Dige show traces of extant structures on and adjacent to the site. Some of these can be clearly related to buildings on 19th- and early 20th-century maps, but other features cannot and may be earlier in date. The results also suggest the presence of a large ditch to the N of the site, and possibly other structural remains along the main ridge which runs E–W through the site.